Fortune REIT's FY18 distribution income went up 1.6% to HK$986m, 1% ahead of our estimate. Renovation works at Fortune Kingswood proceeding smoothly. BUY with HK$10.76 Target Price. FORTUNE REAL ESTATE INV TRUST (SGX:F25U, Fortune REIT)’s FY18’s distribution income grew by a marginal 1.6% to HK$986m due to a combination of slightly higher rental earnings and lower cash interest expenses. 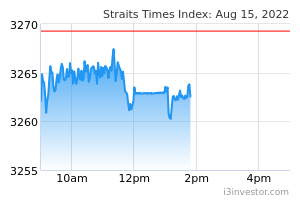 DPU rose 1% to HK$0.513. Total revenue was largely flat at HK$1.94bn in FY18. Excluding Provident Square that was sold in Feb-18 and Fortune Kingswood where renovation works are underway, revenue would have risen 3.9% on a like-for-like basis thanks to positive rental reversion and higher carpark income. Rental reversion on renewals remained healthy at 12.7% in FY18. (1H18: 13.6%). Better-than-average reversionary growth came from F&B and education tenants. With cost-to-income ratio improving to 21.8% from FY17’s 22.4%, net property income (NPI) rose 1% to HK$1.47bn (or 4.5% on like-for-like basis). Portfolio occupancy retreated to 93.1% in Dec-18 from Jun-18’s 96% mainly due to increased vacancy at Fortune Kingswood. Elsewhere, Ma On Shan Plaza and Fortune Metropolis also suffered higher vacancy due to tenant repositioning but this should be temporary. Fortune REIT is carrying out the renovation works at the West Block of Fortune Kingswood in three phases. Phase I is almost complete with 70-80% of enhanced area already committed. The entire renovation is expected to be completed by end-2019. Total capex is estimated at HK$150m with expected ROI of 10%. The asset enhancement exercise at the East Block is under planning with renovation expected to commence in 2020. The East Block will be repositioned to become a one-stop lifestyle and entertainment destination for the Yuen Long area. Despite higher HIBOR, cash interest expenses fell 0.6% to HK$267m in FY18 as Fortune REIT prepaid its HK$1.95bn loan using the proceeds from the disposal of Provident Square. As of Dec-18, total borrowings stood at HK$8.9bn. Aided by increased property valuations, Fortune REIT’s gearing improved to 20.9% in Dec-18 from Jun-18’s 22.3% with no refinancing till 2020. Interest cost for 57% of debt was hedged with the aid of interest rate swaps and caps. 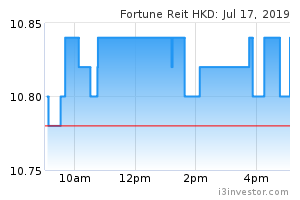 Should Fortune REIT raise its gearing to the statutory limit of 45%, it would have HK$18.7bn for new acquisitions. Yet, given the current low market yield, yield-accretive acquisitions is challenging. Fortune REIT offers distribution yield of 5.3% for FY19-20. Over 60% of its rental income is derived from tenants selling consumer staples whose businesses are stable across economic cycles. This points to resilient income. Additionally, there should be rental uplift from asset enhancement initiatives at Fortune Kingswood. Maintain BUY with DDM-based Target Price of HK$10.76.